The time to think about home fire safety isn’t when the smoke alarms are going off; the best time for preparation was yesterday, and the second best time is today. According to the National Fire Protection Association (NFPA), more than 2,500 people die every year in residential fires and another 10,000 are injured. Not only are there huge human costs but also monetary costs, about $5 billion annually. NFPA reports that there are about 350,000 residential house fires each year, so fires are a very real concern for homeowners. But, taking simple preventative steps can save your home and your life. 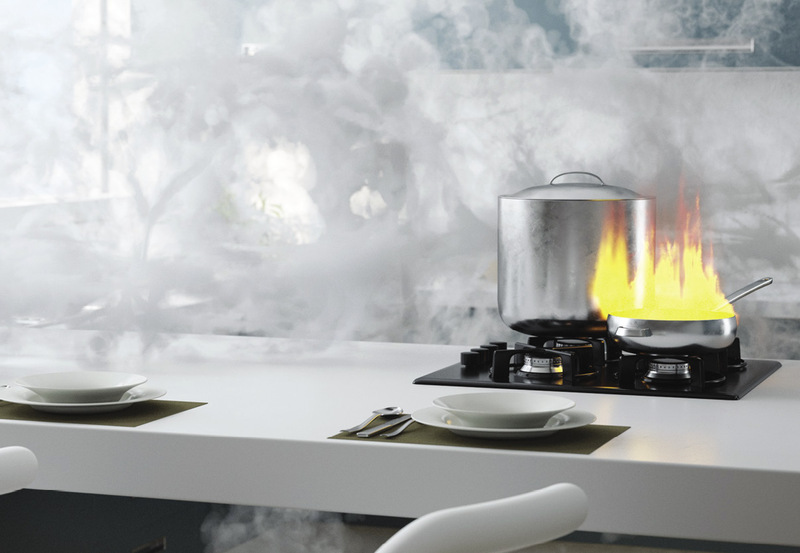 Cooking has long been the leading cause of home fires and home fire injuries, according to the NFPA. Ranges or cooktops account for the majority (62 percent) of home structure fires involving cooking equipment. You may call your unclean stove top messy, but safety experts would call it dangerous. Not cleaning your stovetop can result in grease buildup, which is flammable. If a grease or oil fire does occur, do not try to stop it with water. Water on a grease or oil fire will only make the fire bigger. Instead, smother the fire with a nearby pan lid or cookie sheet. What’s worse than a messy stovetop? A missing cook in the kitchen. Unattended cooking was by far the leading contributing factor in cooking fires and fire deaths. It’s important to always stay in the kitchen while you are frying, grilling, boiling or broiling food. Leaving the stove on while you’re not watching can spell disaster. The stove is a hazard zone in other ways as well. Make sure that flammable items like curtains and oven mitts are safety away from the stovetop. Sleeves and loose clothing can also catch fire if dangled near a stovetop, so wear short or rolled-up sleeves when cooking. Rambunctious children can accidentally knock over cooking pans or wreak other havoc in the kitchen. Keep them safe by having a “kid-free zone” at least three feet around the stove and other areas where hot food is prepared. In the event of a fire, the most important thing to do is keep calm. If it is a small grease fire in a pan or pot, smother the fire by putting a lid over it to deprive the flame of oxygen. Turn off the heat and let the flame die out by not moving the pan until it has cooled completely. For an oven fire, turn off the heat immediately and don’t open the oven door, as flames could escape and burn you. After the fire burns out, the oven should be repaired before being used again. Kitchens aren’t the only home fire danger, however. Brooke Dobson from Community Risk Reduction at the Anchorage Fire Department notes that the leading causes of residential fires in Anchorage are cooking (21 percent), appliances (11 percent), heating equipment (10 percent), electrical malfunctions (9 percent), and smoking (8 percent). In 2016, Alaska had over 800 reported residential fires, which caused a direct loss of a staggering $26 million, with 52 civilian injuries, 15 civilian deaths, and 23 firefighter injuries. Brooke says that the home can have many hidden hazards for those not familiar with fire dangers. Heating equipment, a must-have during the chilly winters, and chimneys should be cleaned and inspected annually by a professional to ensure they’re still functioning properly. Remember to keep anything flammable, like blankets or curtains or books, at least three feet from any heating equipment like portable space heaters or fireplaces. Candles, too, should be kept at a safe distance (at least 12 inches) from anything that can burn and should never be left unattended. Place lighted candles where they cannot be reached or knocked over by kids and pets. Careless smoking is another big fire hazard. In fact, smoking has consistently been the single largest cause of home fire deaths for decades. If you smoke, do it only outside and use fire-safe cigarettes. When putting out the cigarettes, use a sturdy ashtray that is situated away from flammable items like books or magazines. Don’t throw out cigarettes into bushes, as there could be dried material like leaves that ignite quickly. The most important items to prepare for a home fire are working smoke alarms in every bedroom room of the home. However, a shocking number of households don’t have this basic fire safety tool. About 60 percent of home fire deaths happen in homes without working smoke alarms. Working smoke alarms cut the risk of dying in a reported home fire in half, notes the NFPA. The alarms should be connected so that when one sounds, they all sound. But having all these smoke alarms isn’t helpful unless they’re properly working. Make sure to test each smoke alarm once a month by pressing the test button. “Working smoke alarms save lives! Make sure they are installed in every bedroom, and on every level of the home. Test smoke alarms once a month and replace batteries once a year. Smoke alarms should be replaced at least every 10 years,” says Brooke. Cari Dighton, regional communications officer for the Red Cross of Alaska, emphasizes the importance of smoke alarms through the Red Cross’ Home Fire Campaign. Established in 2014, the Home Fire Campaign looks to install smoke alarms in homes without them, as well as provide fire prevention education. However, there are still many people in Alaska, and across the nation, who don’t understand the importance of smoke alarms and their upkeep. “We’re all kind of guilty of that: ignoring things that are out of the line of sight. It’s easy to forget to check smoke alarms monthly when they’re out of sight and out of mind,” Cari explains. However, don’t stop your fire prevention with just smoke alarms. Some homeowners install smoke alarms and think that they’re prepared for a home fire, which is not necessarily the case, notes Brooke. Also, have items in place that will help if the fire is already spreading rapidly. Escape ladders are essential for any multi-story home. 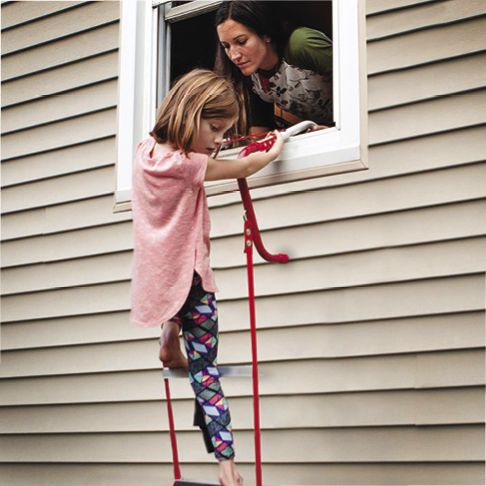 Most escape ladders have a length of either 13-15 feet or 23-25 feet, so ensure that you’re getting ladders that will reach from the upper level window to the ground safely. Store one ladder in every sleeping room in the upper stories. For smaller fires, a fire extinguisher can be the difference between a small fire being contained or the fire spreading to the entire home. Have at least one fire extinguisher on every floor of the home, especially in rooms with the highest likelihood of fire like the kitchen. 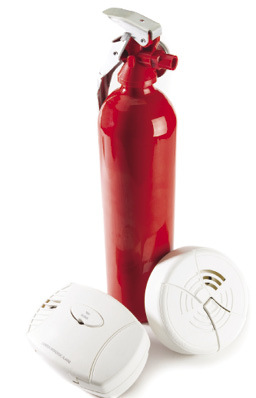 While fire extinguishers are useful, only use them for small, easily contained fires. It is easy to get injured or trapped in a fire if you try to be a hero and take on a big fire with just a fire extinguisher. Instead, just exit the house and call emergency services. A parent’s worst nightmare is trying to get their family out of the house safely in a fire. Often, children will be confused in the event of a house fire and not know how to react. Fires can spread quickly, with as little as two minutes after the smoke alarm first sounds to get out, making a quick reaction extremely important. This is why it is essential for parents to create and review a fire escape plan with their children. The escape plan should include two exits, like doors or windows, from every room; the number of local emergency services or 911; and a set meeting place at a safe distance outside the home where everyone will meet immediately upon exiting. If a pet or family member is still trapped inside, tell the fire department immediately. After creating your escape plan and set a meeting spot outside the home, walk your family through your home and point out all the possible exits and how they should react in the event of a fire. Being thorough and prepared could save a family member’s life! While smoke alarms are an essential tool for fire safety, this misconception can be dangerous. Smoke alarms only alert that there is a fire in the home, but do nothing to suppress it. Brooke recommends incorporating other fire safety items, like sprinklers, to help stop the fire. 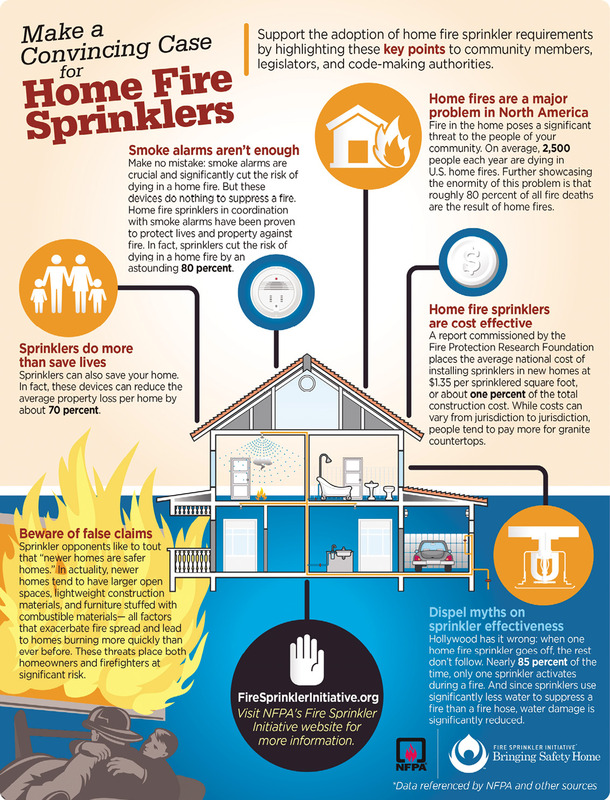 She also explained that misconceptions about sprinklers often keep homeowners from utilizing them. One myth is that sprinklers are too expensive, but in reality, the average cost to install them is only about $1.35 per sprinklered square foot. That’s a small price to pay for peace of mind!